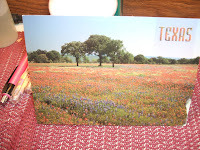 well here we go again and this one came from a dear lady in texas .As I have posted before I am a member of postcrossing and am truly loving it . Now I have to catch up on post cards and start repurposing these and sending more which I hope to do soon . god bless all and take care dears and stay safe no matter where you are . Hey there all this is a wonderfull postcard I received from Taiwan from a college student there . 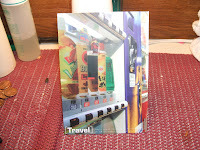 I had recently joined postcrossing and received this really nice post card . wow post crossing is so much fun and I really like it . Thanks again to the awesome ms . aj jong from taiwan . Oh wow has everyone heard about the new trend for the us government taxing junk food ? of course junk food is not any good for anybody but one does have to wonder about the hard working single mom who really just needs to feed the kids really quickly and she knows that they will eat hot dogs and potatoe chips and that can of soda but why tax it more when she is already trying to make ends make . It is very hard already to buy food in the country I cannot imagine this tax bill passing when half this country is getting food stamps as it is . I think it is absoloutly crazy to do this in hard economic times . I hope it does not pass . I must admit sometimes I am a junk food junkie . Also to add note I refuse to take medical advice from anyone who eats cheetos at ten in the morning . LOL !!!! so I am still running on empty of course is there any other way ? I think sometimes we all put ourselves around ppl who are very depressive and we have to listen because there is no escape and then you have to sit and listen . It seem like lately the only nice thing in my life is the letter I receive from my pen pals . I am also very glad that my husband is back to working and will have our own place soon I hope . The doggies will also have some place to run and not have to worry about fleas jumping on them since my coussie s house has so many out in the yard you really cant walk out there with out having some jump on you . all of you who share your life with pups know what I am talking about . We have also paid to have this yard sprayed every month and to no avail still fleas . The green man does not do much folks take my word for it . Blessings to all and we shall talk later . I love the idea of repurposing things and one of my dear friends that is also a pen pal gave me and idea this week about repurposing envelopes . Of course I have made my own envelopes from scrapbooking sheets and those came out really great and they travel well so I am now going to start and experiment with my family and friends and have them send me all their return envelopes that they get with their bills . so we shall see how that goes . I will let all my readers know how this experiment turns out . well and good I hope . talk to everyone soon . You see sometimes I think people think it is okay to lay every bit of sh*t they can on me and I am not supposed to stress over it or think anything of it . I just repeat the msgs that I am privy to , so that I can repeat them . Today is a stinking day and I really hope I receive something in the mail or something really , anything to make me feel better . Today gets stinkier and stinkier as the hours go by. Is that even a word ? stinkier ? dont really know . I really dont like when people take issue with me because I speak loud and I really think that is something left over from my childhood . we had alot of kids in our family and we all had to talk loud to be heard . Okay so now I am talking in a whisper seems like ppl around me are happier that way . 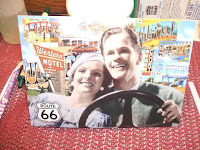 hey there everyone my pen pals are just some of the most awesome people in the world and you can imagine what a happy dance I did at the mail box when I received this wonderfull route 66 postcard . That wonderfull girl linsey . thanks linsey I love all my pen pals . I love snail mail and it is awesome . The motto here be good to people and they will be good to you . aside from that I have a thought to leave you with . You know my grandmother said many times over "rejection is god"s protection " and I bet if you think back you can remember a time when that saying rang very true for you . I know I did just last night when I thought of a lost relationship with a lost person . Okay well that is enough for today god bless and take care . Hello all this is an interesting link I found from a pen pal and think you all should check it out . http://www.everydaycorrespondence.com I think it is a wonderfull thing . check it out everyone and that is all for today . oh the woes of insurance companies !!! well here we go again , my husband made a phone call to the insurance company yesterday just to get some information and we he started telling the lady that he was considering taking their plan she came back with oh we dont have your number in our system . "duh we just said we wanted some information . I must admit I thought back to that portion of the movie with ben stiller "meet the fockers " , when he told the stewardess to take those sticks out of her head and then maybe she would be able to think straight . I mean do they just throw these ppl on the phone without any kind of training whatsoever ? anyway back to my original point . My husband told them that I have insulin dependant diabetes and he wanted to know what they would cover on that and the lady told him that they would not cover anything they would reject the policy . This my dear friends is what is known as cherry picking in the insurance industry . In other words they will only cover healthy ppl so that they wont end up paying out too much . You know they are in the business to make money not spend it . I still say we need socialized medicine in this country . The more it sounds like to me that they dont want to cover ppl with previous illness that they would just prefer you die and sadly my friends I do believe more and more that is the truth . Oh well enough venting today my friends I might be in a better mood tommorow . Okay well it has been awhile since I last blogged and now have since joined sendsomething .net . It is a wonderfull site for those of you that like to write letters or send care packages and what have you it is great . Check it out and it really does keep my mind straight and have received some really nice and cute things through the mail . I cannot believe how some ppl are so talented and dont even really know it . of course I show my husband all these great things and he says wow , I dont know if it is really wow or he is just appesing me or who knows I will leave it at that . I have learned of so many sites through other people and for the post part they are interesting and for those of you who are really into crafts please check out the holocaust butterfly project . If you just google the holocaust butterfly project it will come up . If I was good at crafts I would do it but just not that talented I am sorry to say . Oh well that is all I have to say for now and am looking forward to the mail this wk love getting mail it makes my heart sing .